With over 40 years experience Turbo Power Systems is a North East lead company that specialises in the design and manufacture of high performance motors and generators. Turbo Power Systems approached us as they felt their existing web site was dated and in need of restructuring as it wasn’t the easiest for their users to find information. The main requirement for the new site was for it to be built responsively as their analysis of the site had shown an increase in visit on mobiles and tablets and as the site wasn’t built for these devices these visitors weren’t currently getting a good user experience when viewing the website. One of the challenges of this project was the amount of information they needed to supply on their website. To overcome this hurdle we worked closely with TPS to create a sitemap that created a natural flow to the site, making it easy for the users to navigate to a section and also the sub sections within it. Once we were sure that the sites structure was correct we began developing the sites wireframes and then implemented TPS’s well established brand. 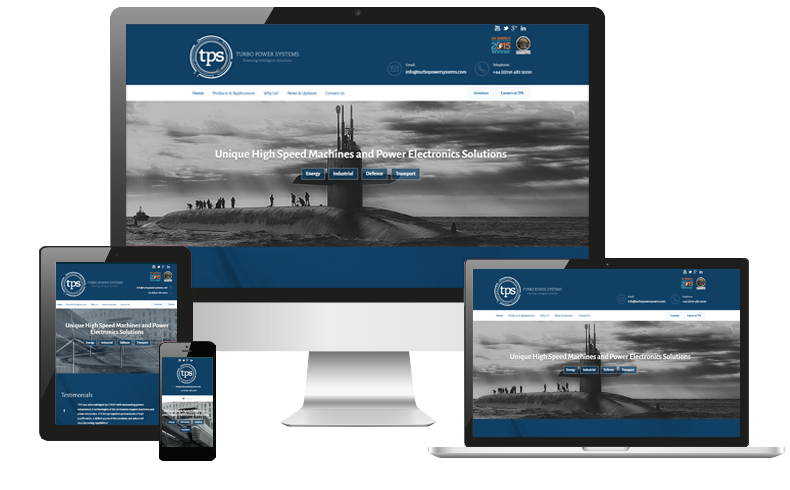 The completed website was built with a content management system to make it easy for TPS to update their customers and investors with their latest news and press releases.